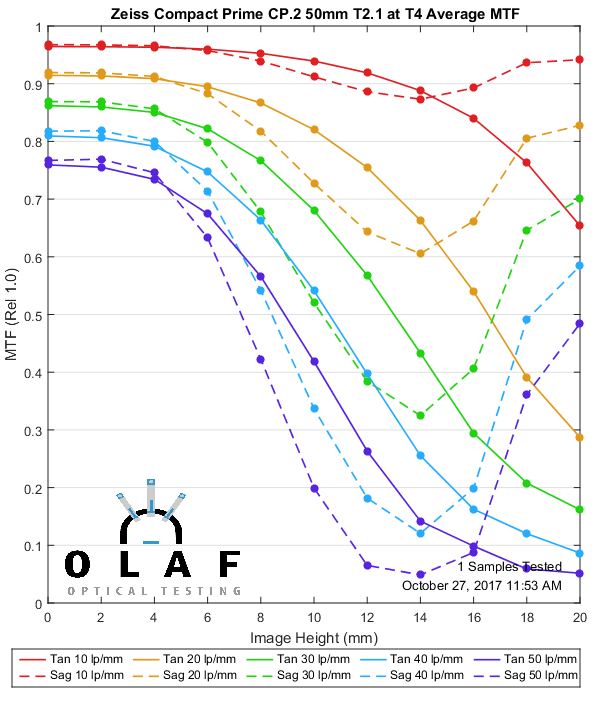 OK, in the last post we did something useful, but rather boring: we looked at how MTF changes when lenses are stopped down. 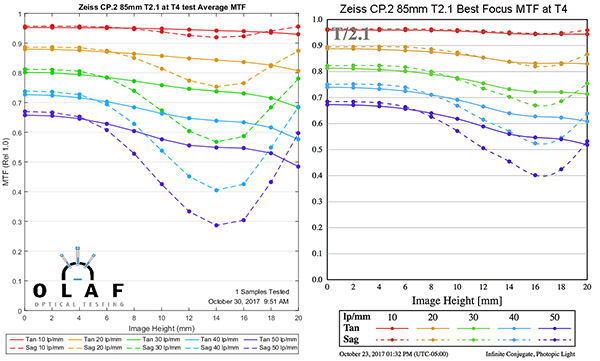 Today we’re going to use a more powerful optical bench tool, the MTF vs. Field vs. Focus. Unless you work in a metrology lab (and probably not even then, very few are performing this test) you aren’t familiar with what this is, so I’m going to take a minute to show you. The machine very accurately focuses on the center point of the lens. It then measures the MTF from the center to one edge at that best center focus. When that is done, you get the MTF graph you are used to seeing. 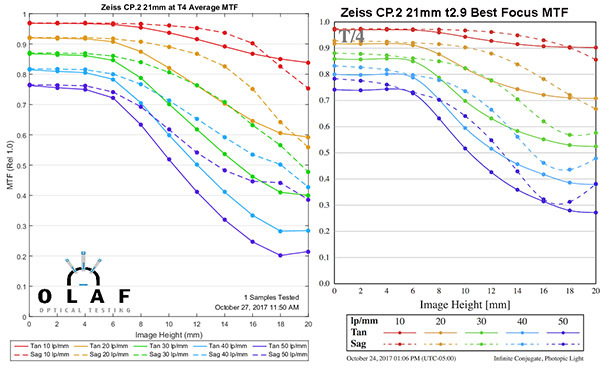 The standard MTF says “if you focus at the center of the lens, the graph shows you how sharp the image will be from one edge to the other.” The graph above shows the image for the standard MTF for the Zeiss CP.2 35mm T2.1 and shows us it stays pretty sharp from one edge to the other. A lot of lenses don’t stay sharp from one side to the other, though. The machine then backs the focus away 300 microns from that focus. The machine then measures the MTF, moves forward a few microns, and measures it again. Basically, at every point it measures the MTF 20 times, changing focus a bit each time. The machine repeats this step at 40 points from one side of the lens to the other. So what we end up with is a huge bunch of data. 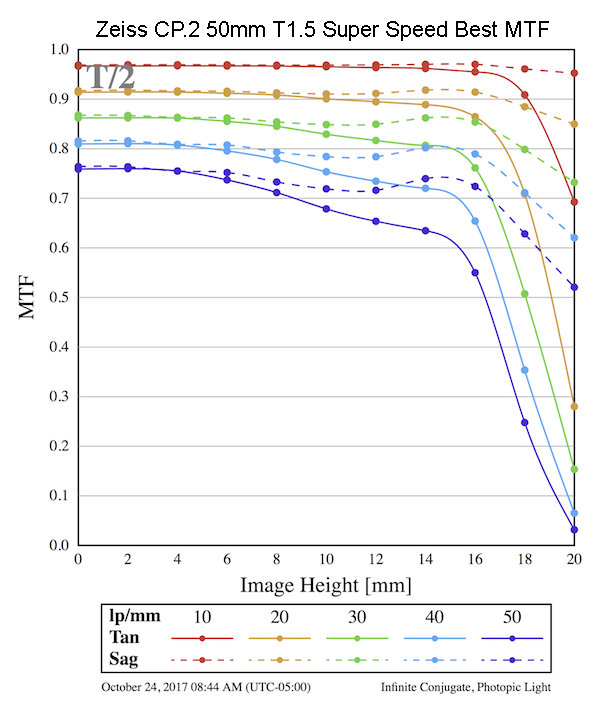 At each of 21 points across the lens, there are 800 measurements saved compared to 20 measurements per point (sagittal and tangential, each at five frequencies) on a standard MTF. That’s a lot of data; a bit over 16,800 data points per tested lens. We usually graph it something like this. That’s good information. It shows you how the field of focus curves if you’re focused on the center point. For the lens above, it also shows you that away from the center, the image will be sharpest at a different focusing distance than it is at the center. The “0” in the middle of the Y axis is the best center focus, the top and bottom of the charts are +/- 0.3mm of focusing distance. In other words, if you focus at the center, your image will be sharper closer or further away as you look from one side to the other; what we call field curvature. But back to MTF. Let’s take a close up of the sagittal field on the right. I’m also going to draw a black line across the graph to show the focusing distance chosen as “best focus distance for the center of the image.” That black line shows you where the focus was for the standard MTF, and the MTF values along that line are what the standard MTF showed. 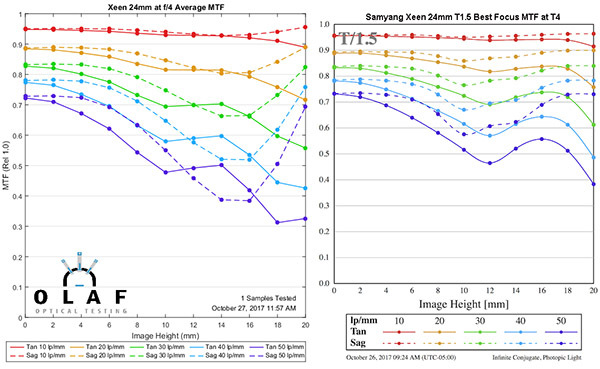 The graph below is that standard MTF, and it shows the lens is quite soft 12 to 16mm away from the center (the outer 1/3 of the image). But if you look at the field curvature above, you know that softness is because the best center focus isn’t the best focus for most other points across the field. The lens could be a lot sharper from 10m to 16mm if we had focused there, instead of at the center. Why is this practical? When I make an image with the subject in the outer 1/3 of the image, well, I’ll focus in the outer 1/3 of the image. 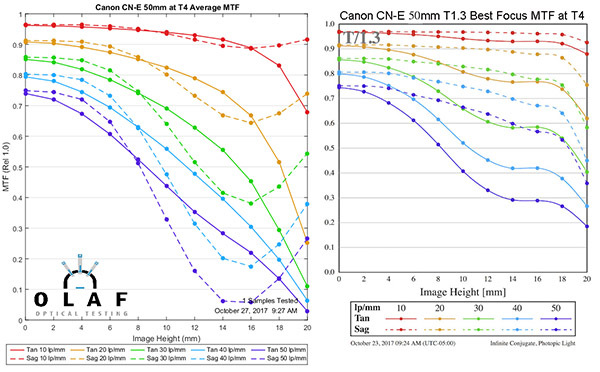 When a lens has strong field curvature, as this one does, the standard MTF curve doesn’t tell me a thing about how sharp the image might be if I focus there instead of the center. We’ve been busy writing programs that let us get more information from the MTF v Field v Focus test. The one I’m going to show you today is ‘individually focused MTF,’ which will answer the question ‘how sharp is it when I focus there?’ In other words, if I focused the lens at the point 10mm off center instead of at the center, how good would the MTF at 10mm be? We could search through those 16,000 data points in the MTF v Field v Focus graph from center to edge, plotting ‘what is the best possible MTF at each individual point if we focused there.’ If I plot this ‘best individual focus MTF,’ it looks entirely different than the standard MTF above. They look like two different lenses, don’t they? In reality, depending on how you use them, they are. If you focus at the center point, you get the standard MTF graph on the left. The standard MTF suggests that the lens is really sharp for about 5mm to either side of center (the middle 1/4 of the image) then falls off. 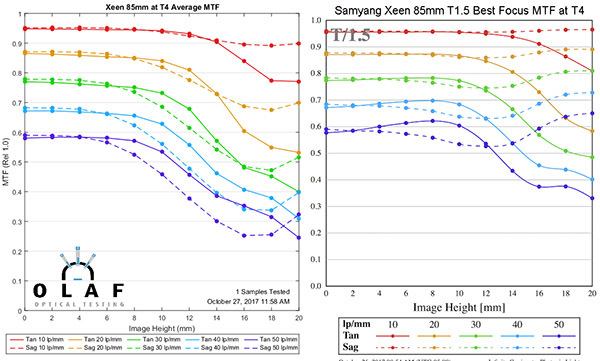 If you focus at a specific point away from center, though, the ‘best individual focus MTF’ graph shows you can get a sharp subject all the way out to nearly 16mm from center, which is all but the very edge of the image. Remember, though; the graph isn’t reality. If you did focus at, say 16mm away from the center, the rest of the image wouldn’t be as sharp as the graph says. The center would be quite soft if you focused at the point 16mm away from the center, just like the 16mm point is soft when you focused at the center. 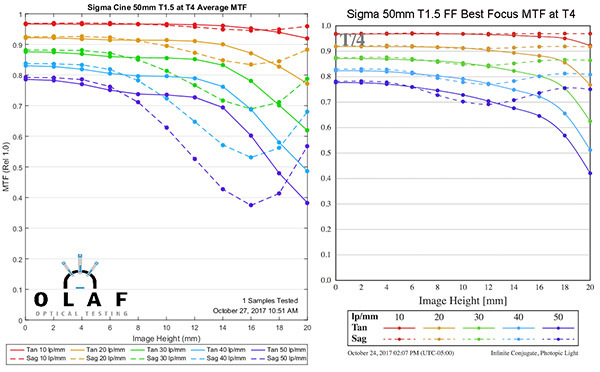 The best individual focus MTF graph tells you is how sharp the image could be at each single point; it says nothing about how the rest of the lens would look if you focused there. To demonstrate, here’s what the Zeiss 50mm T1.5 MTF looks like if I set the focus to be best at 14mm away from the center. Still, this is good information to have. If you’re framing a scene with an off-center subject, knowing how far from center you can get a sharp image is useful. And it’s different for each lens; there’s no general rule for how far away from center you can stay sharp. This is an extreme example; most lenses don’t change this much if we compare standard MTF and best individual focus MTF. But most lenses do change to some degree. 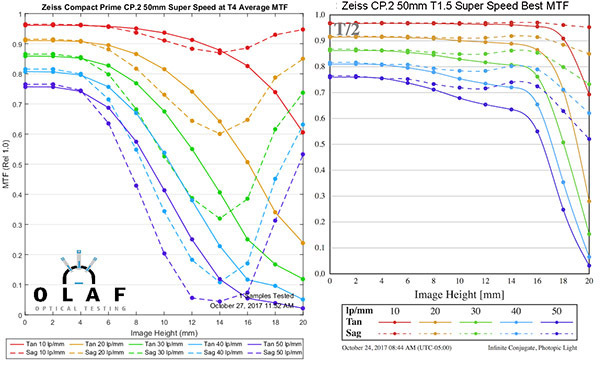 As an aside, this is a nice illustration showing that when people argue about whether the Zeiss 50mm Super Speed (as an example) is soft or sharp away from center, well, they’re both right. It depends on how they’re using the lens. A landscape or architectural photographer focusing in the center would say the lens is very soft in the outer half. A portrait photographer would counter that the eyelashes of his subject are very sharp even though they are posed in the outer 1/3 of the image. 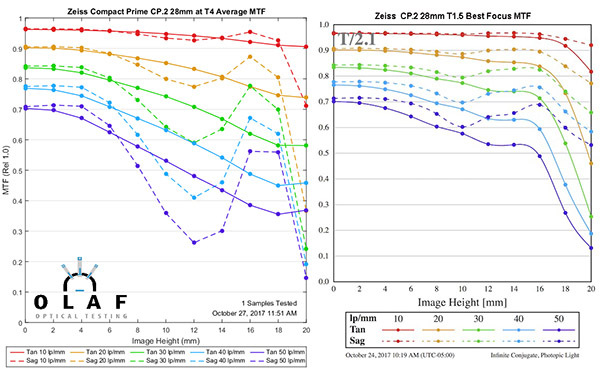 I’m going to put up the best focus MTF charts for all of the Cinema primes we tested in the last article. On the left is the MTF taken at T4 in the standard way, on the right the ‘best individual focus MTF’. The graphs are slightly different sizes because the best focus MTFs are from a beta version of our new software. If enough people think this is something they will find useful, we’ll start publishing them for all of the lenses we test. All of the 85mm lenses show some improvement at best focus and perform well far away from the center. And then there’s the Sigma 85mm. I don’t have the words, other than I been telling you all that lens is amazing. The Canon 85 can get ‘near center’ sharp out nearly half-way to the edge. 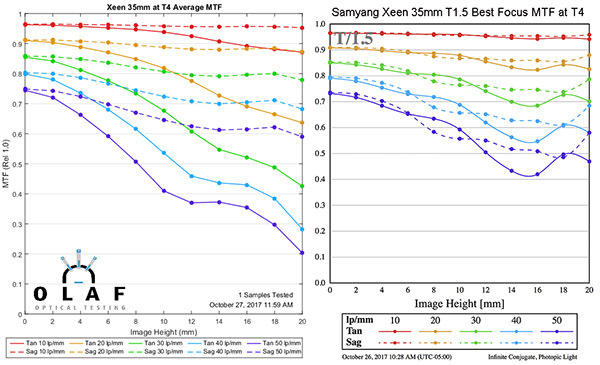 Further than that there is some loss of fine detail (higher frequency lines) but it’s not severe at T4. I really wouldn’t hesitate to use this lens all the way to the edge of the field. I am unworthy. There is moderately mind-boggling goodness all the way to the edge. The Xeen 85mm really didn’t drop its MTF until halfway to the edge when we used center focus. There is some improvement in the outer 1/2 with best individual focus, but performance does fall off a bit beginning 2/3 of the way to the edge. 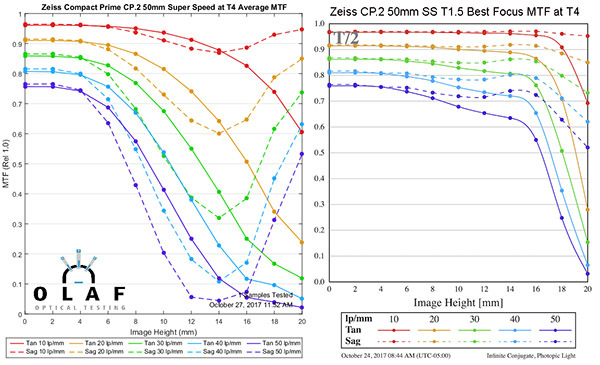 The Zeiss Super Speed does improve to some degree with best individual focus, and there’s no sudden drop off. The two Zeiss 85mm, if I remember correctly, are identical optically and differ only in the mechanical size of the aperture. It’s not surprising that they behave similarly at T4. As the field gets wider, we expect to see more weakness near the edge of the field, even with best possible focus, since there are often more aberrations. Well, it is a very old design and the only T1.3 lens at 50mm. It struggles a bit away from the center at higher frequencies (fine detail) no matter where you focus. But it is better off axis than the standard MTF curve leads us to expect. OK, it’s not quite as spectacular as the Sigma 85mm, but it’s absolutely excellent to 2/3 of the way to the edge and pretty good even further away. 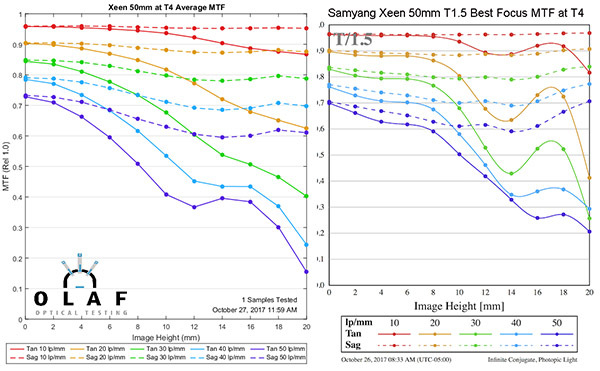 Like the 85mm, the Xeen 50mm doesn’t have a lot of field curvature, but there is some. It stays quite sharp till just under the halfway-to-the-edge point, but you lose sharpness and keep astigmatism in the outer half of images, even at best focus. It’s performs pretty well stopped down but doesn’t improve quite as much as the others at best focus away from center. This was the lens we used in the introduction because the difference is so amazing. It’s exceedingly sharp out to 3/4 of the way to the edge if you’re focusing out there. It’s really close to the Sigma in quality until you get very near the edge. We generally think of wider-angle lenses as having more field curvature, so we’d expect they should look entirely different with best individual focus. They do, but a bit less so than I expected. Probably aberrations are causing more issues than field curvature away from the center at this focal length. Again, things look a better away from the center than the standard MTF seems to indicate. It’s not quite as sharp as the longer focal length lenses, but then, it’s not the longer focal length lenses. Like I said for the Canon, although perhaps a little better. Remember, the Sigma Cine lenses are much newer designs than the others we’re testing here. The Rokinons seemed to improve the least at the longer focal lengths, but may improve the most here at 35mm. That’s a dramatic difference. While we do get some improvement with the Zeiss 35 T2.1, it’s not dramatic. I was less certain what to expect with the wider lenses; they do have field curvature, but also tend to have more aberrations away from center that don’t improve with specific focus. 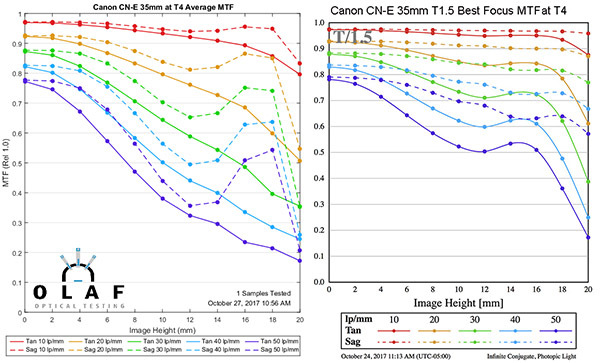 The Canon 24mm shows it’s capable of better performance off-axis than the standard MTF curve suggests. It has near-center sharpness to 8mm away from center, and decent performance to about 12mm before falling off. 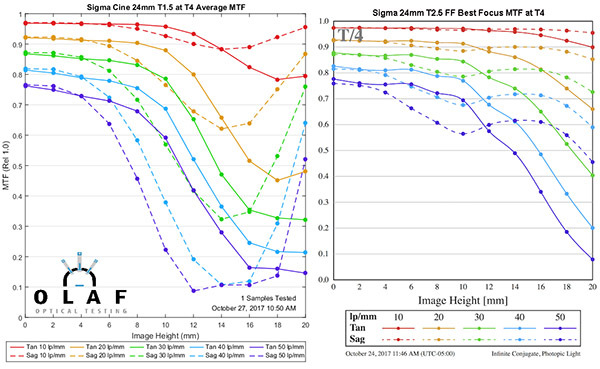 The Sigma 24mm standard MTF curve looks a bit like the Zeiss 50mm SS, and I was hoping for dramatic improvement at best focus. It does improve, no question, but in the outer 1/3 there is still significant fall off. 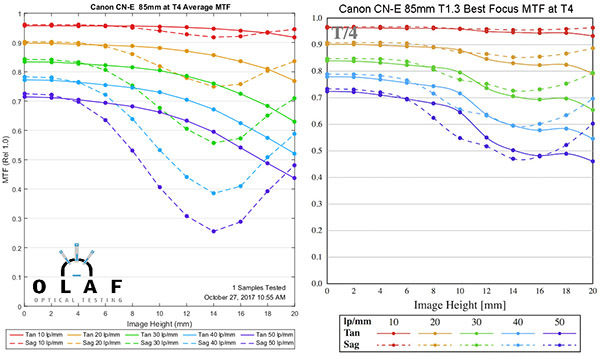 It does perform better in the middle 1/3 of the image than the standard MTF curve suggests. Similar to the 35mm, the Rokinon 24mm’s best individual focus stays good a bit further out than most 24mm lenses. The Zeiss 28mm is another lens that shows decent performance 3/4 of the way to the edge with best individual focus MTF, much better than the standard MTF suggests. The legendary 21mm Zeiss does improve a little bit with best individual point focus. The ‘most sharp’ area ends about 6mm away from center with both standard and best focus MTF, though. With the last post, it was obvious that we should add MTF tests at apertures other than wide open. The Best Individual Focus MTF (BIF-MTF) is a different thing. For one, it’s strange. You’ve never seen it before because no one’s ever done it before. For the major piece of data it presents, ‘How far from the center can you focus and get near-center sharpness at that point’, I could give as a number without showing the graph. 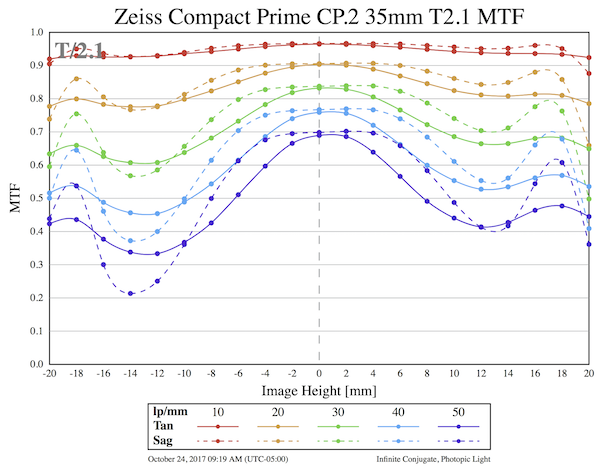 For example, it would be 6mm (about 1/3 the way to the edge) for the Zeiss 21mm above; or 15mm (3/4 the way to the edge) for the Zeiss CP.2 50mm Super Speed. The graphs, though, do present a better picture of whether the drop off is gradual, or sudden. So I’m open to discussion as to whether the graphs are worth showing in our reports. To some degree, you can get that information from the Field Curvature graphs, which we are going to show with all lenses going forward, but the field curvature compresses the data a lot. You can’t tell if a red area in the Field Curvature graph is .80 or .89 and that can be a big difference. There’s another neat trick we can do with the MTF v Field v Focus data that may be more useful for some types of images, but this post is already plenty long so we’ll save that for Part III. Addendum: As Ilya pointed out in the comments, the beta software BIF-MTF graphs have a soft gray T number in the upper left corner. Please ignore them, it’s an artifact caused by a combination of not-quite-finished software being used by my very tired brain. …without much of an explanation, though. It’s apparently showing the properties of some telescope. It might be that this is some sort of standard measurement in astronomical circles but I wouldn’t know about that. My own guess: Something about the sharpness or size of the airy disk, as a function of wavelength and either focus setting or distance from the eyepiece. Not sure what the x axis whould mean exactly, as zero or negative numbers don’t make much sense if it was really the disk size. Maybe it’s rather the displacement of the disk’s center, for an off-axis point source? Brilliant! This is what I originally believed MTF graphs to show, and I think it’s exactly what is the more representative thing in many real situations. Exceptions are of course focus-and-recomposing or “wall photography” (test charts, reproductive photos of paintings… PIV) where all the things that need to be in focus are actually in a plane. As such, I’d say that the BIF graphs are even more relevant than the regular ones (although, of course those still aren’t useless). 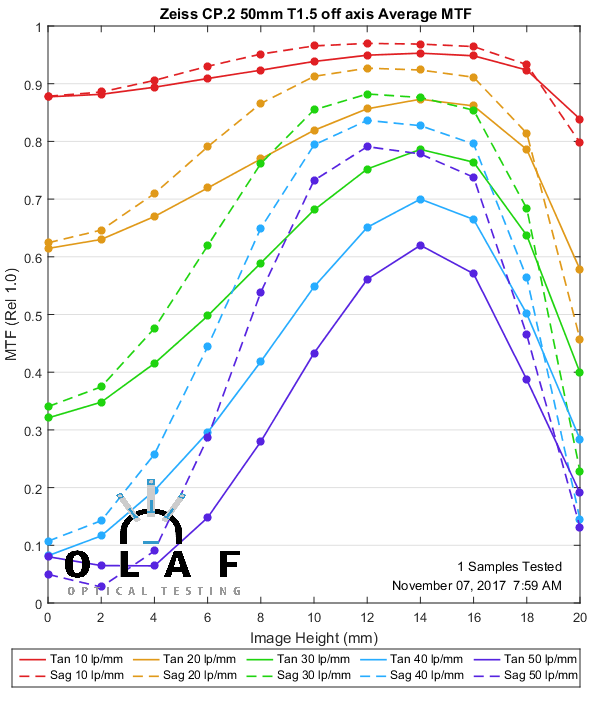 I wonder how many cheaper lenses with good center sharpness but bad off-center numbers in regular MTF tests may actually look much better in BIF tests. I guess there will be some lenses that will suddenly look a lot more interesting, and some who won’t. This is very useful data when choosing a lens, particularly for those who like to use off-center focus points to place their subject. At the end of the day, flat field isn’t all that important for a lot of subjects (e.g. portraits) because the vast majority of the image is intentionally out of focus. This data clearly shows how good the focal point of the image can be when that focal point is off center. Combined with the field curvature chart, you can get a good idea of the area that will be in or near optimum focus when using an off-center focus point. The ideal tool would be an algorithm that has access to all those test points that would handily draw you an MTF chart around a chosen focus point. I see birth of a new software business :-). I totally LOVE this article. This is a genius idea! So relevant to the way I actually need and use my lenses in day-to-day life! How often do I focus dead center, anyway? Thank you, thank you, thank you!!!!! What’s this??? A chart that Roger and Brandon don’t already do???!!!!?!? Insanely good. 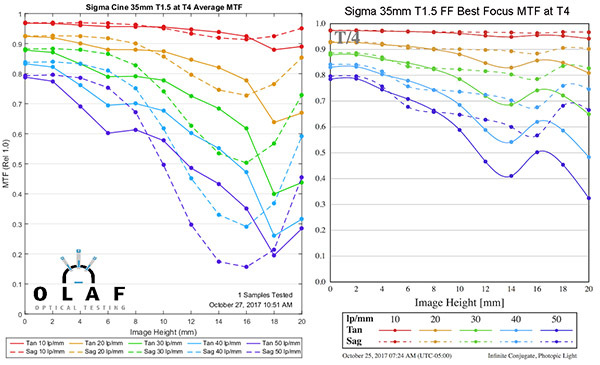 I used to think Sigma reversed engineered and then improved Zeiss designs. 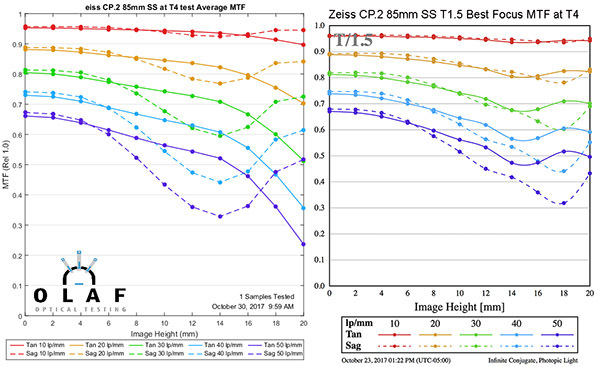 Looks like Zeiss needs to do the same with Sigma now. With “Focus fine tuning” feature of modern lenses and cameras, you could even dial such numbers as to automatically use “best across the frame” focusing when you focus with the central point. Could be useful for landscape, for example, but probably to awkward to use and unusable for other situations. Presumably the optimal focus location is defined as something like the position that maximizes the sum of the areas under all the MTF curves? I suppose I’ll find out tomorrow! You win the guessing game. Stay tuned tomorrow. It strikes me that another very useful way to slice this data would be to use it to define a focus plane that optimizes focus for the most points across the focus plane. In other words, to define the plane that produces the highest average focus integrated across the entire plane. 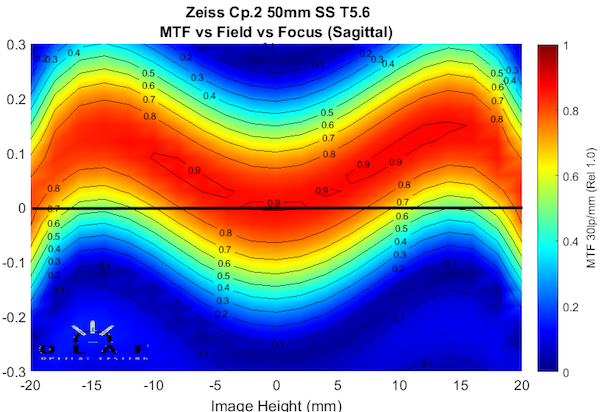 For example, for the Zeiss 50mm lens, it appears that placing the focus plane approximately 0.1 mm forward of the zero position on the tangential plot and 0.08 mm forward on the sagittal plot would produce the highest average focus across the plane. If one were willing to sacrifice a bit of sharpness in the center of the image for the sake of overall better focus this could potentially be valuable (assuming that sharpness was the desired goal.) Or are these differences so small that it wouldn’t be possible to actually make such fine adjustments when manually focusing the lens? Can your software do this? Would be interesting. Thank you, Michael. Fixed that. First of all Imwant to thank you for the amazing work you are doing and for sharing it with us. And I really like your humor/sarcasm that makes all the most interesting but rather dry facts much more entertaining. Just on minor issue: as far as I know (and read the graphs) 0.3 mm equals 300 microns not 30 microns (top of the article). And please, give us more of the good stuff. But it doesn’t make sense. Roughly where “Z” is everything bends, I’m guessing that’s a lens. But each color has a different angle of incidence and …ray height? No idea what -0.3mm to +0.3mm indicates. I guess it plots the optical path of light by frequencies (colors) to show that all the “useful” ones focus pretty much in the same spot. Thanks for yet another great read. Definitely count me as one of the readers interested in seeing BIF plots in future posts. You could also consider making user-tunable MTF plots, which should be straightforward to do from the data you are collecting. What I have in mind is a little slider at the bottom of the plot that selects the location of focus point, with far left being center and far right being focused at the edge. This would allow one to see how the behavior (MTF) of the lens changes as the focus position is changed. I would find this a lot more informative and intuitive than a BIF plot. 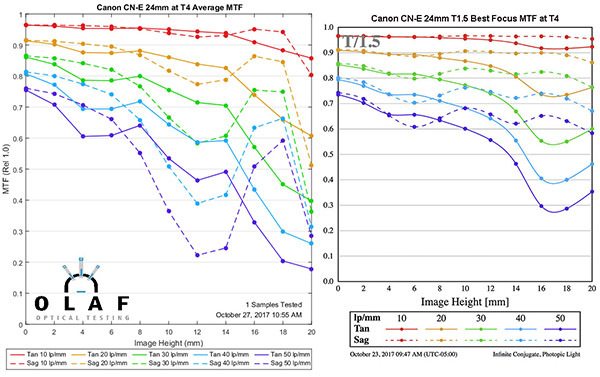 Of course, it doesn’t quite work for print publishing, but for print, one could restrict to just four key MTF plots (e.g. center, 25%, 50%, and 75% to the edge). U could post another practical graph : not far from BIF-MFT, but something near that’s BPF-MFT. on all the frame, but not exactly in the center. I guess that’s what ur eye is used to, when manually focusing in general, for standard purpose framing : so BPF-MFT would be the practical quality u can get from a lens most of the time. 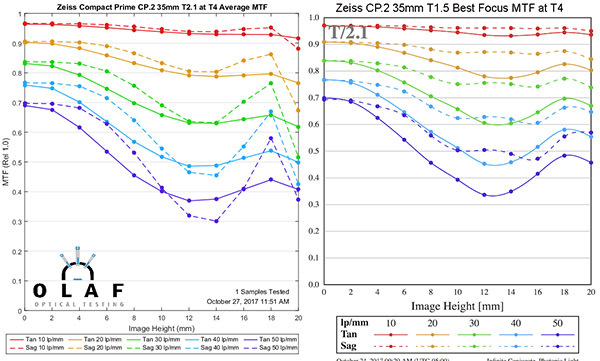 In case of the Zeiss CP.2 35mm T2.1, @5.6 : it seems a +0.05mm focus correction (from a perfect focus in the center) would give the best overall results, for example. 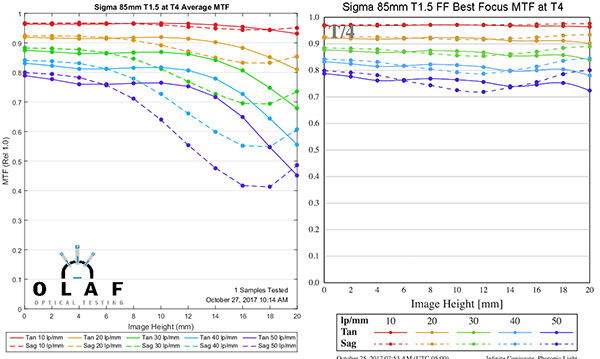 Then u could compare the Zeiss chart with what the Sigma is doing @5.6, with it’s own BPF-MFT @5.6.
i think your findings are relevant to more than just the portrait photographer. i for one am searching for peak sharpness and a uniform field at the same time. the sigma 85 as you have shown seems to provide that. i have to test if it makes a meaningful differenece on my d800 compared to my venerable Ai 85f2. I didn’t mean to say people should shoot at f/8. I was leaning toward the portrait photographer who wants to know how far from center he can get a sharp image at wider apertures.